I think, mostly, Run is a book about family. Not family based on blood ties, the Doyles are largely a family created through adoption, but rather, family as created by love ties. That's what makes it compelling and why I stuck with it to the end. 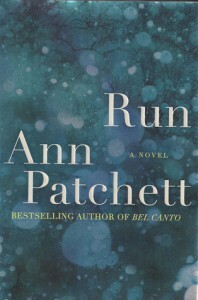 Of course, Ann Patchett is an excellent writer and her prose is easy to follow, so reading her is never a chore. But this "literary" story is not the kind I would ordinarily pick up except that I liked her previous novel, Bel Canto. The story of Run centers about an Irish-Catholic family that struggles with the death of their beloved mother, the strains of parental expectations versus individual desires, being an interracial Catholic family, sacrificing for love of family, and performing well for the love of family. The story opens with the death of the mother, Bernadette, who had been adored by her husband, their one biological child, and the two young black sons they had adopted as infants. But there is a conflict in the extended families--the Doyles and the Sullivans--over who should get the family heirloom. This is a statute of the Virgin Mary that bears a remarkable resemblance to Bernadette. The family tradition is that the statue should pass to the daughter that looks most like it, but the Doyles had no daughters and only one biological son. The father, simply referred to as "Doyle," puts off the decision, preferring to keep the statue for the comfort of the adopted boys until they are grown and the decision is forced. The statue conflict isn't resolved until the end of the novel. For the most of the book, the story moves ahead to the time when the boys, Tip and Teddy, are much older. Tip is at Harvard studying fish (his passion) and Teddy is in High School. Doyle, a former mayor of Boston, tries to ingrain a civic awareness in the boys and he desires that they get into politics as he did. Their don't share the political desire, however. Tip only wants to be an ichthyologist and Teddy's only desire is to be a faithful Catholic, maybe even becoming a priest. The oldest son, Sullivan, left years ago to do charitable work in Africa because he also couldn't fulfill his father's desires for him. He was also estranged because his father channeled his affections to his adopted sons when Sullivan disappointed him. Against this background, the plot (such as it is) takes off when one night, after hearing a lecture by Jesse Jackson, Tip is arguing with Doyle and doesn't see an SUV bearing down on him in the midst of a heavy snowfall. He is saved by a black woman who appears out of nowhere and pushes him out of the vehicle's path, only to be struck herself. Tip and the woman stranger are taken to the hospital. He suffers a broken ankle, but she has a broken hip and other injuries. The woman's eleven year-old daughter was with her and the Doyles take her into their care. The woman turns out to be Tip and Teddy's biological mother, who has been watching their development from afar all these years. Her daughter, Kenya, is aware of her relationship to the boys and has idolized them and their adopting family herself. The development of the relationships between these characters makes up the story. This is decidedly a character-driven, rather than plot-driven, novel. The characters are sympathetic, each with their own passions, angers, and faults. There are no "bad guys" here. Conflicts stem from differing agendas and needs. Tension is built from the process of their working it all out. Patchett is skillful in this and draws the reader into the process, so you come to care for these people and to pull for them. I liked the book, but had the feeling I had heard it before. Hasn't the story of an open-minded white couple raising brilliant black children been done a few times? It might have been more ground-breaking to have an open-minded black couple raising brilliant white kids (or maybe average, bratty white kids). It struck me the kids were too brilliant, or too good. And the oldest, Sullivan, was too forgiving somehow. I think the idea was for a reconciliation that brings him back into the family. It's a beautiful thought, but I think it needed a little more development. As it is, the reconciliation was too sudden and stretched credulity. But still, I liked these characters. Even Teddy, though his reciting lengthy quotes from famous people was more annoying than impressive. I liked Tip's scholarly introversion and his conflict between desire and duty. I liked Sullivan's outgoing compassion and Kenya's innocent support of everyone. Even Doyle's good intentions with not-so-good consequences earn him sympathy for trying. Seeing all these reconcile and make a family was the best part of this story for me. I'm not clear on why the book is entitled, Run. There's the obvious allusions to Doyle's political leanings and his desire for his boys to run for office, and to Kenya's love of running track. It may have something to do with running (for office) being what the boys don't want to do, and what Kenya (running track) wants to do. Or Sullivan running away (from his father) may play into it. Ms Patchett did do a good job at setting her scenes. She provides a good feel for the Boston area, the feel and effects of a heavy northeastern snow, and the ambiance of Catholicism. Overall, though I liked the characters and Patchett's writing, I felt the story was a bit too stereotyped and light on drama. I rated it 3 stars because I'm sure Ms Patchett can do better.